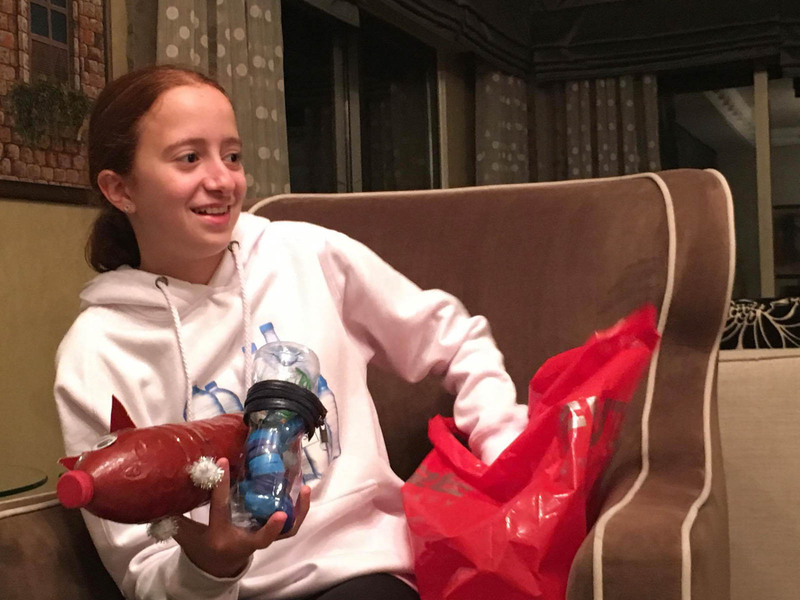 Four thirteen years olds are trying to create a cleaner country by reducing plastic waste. 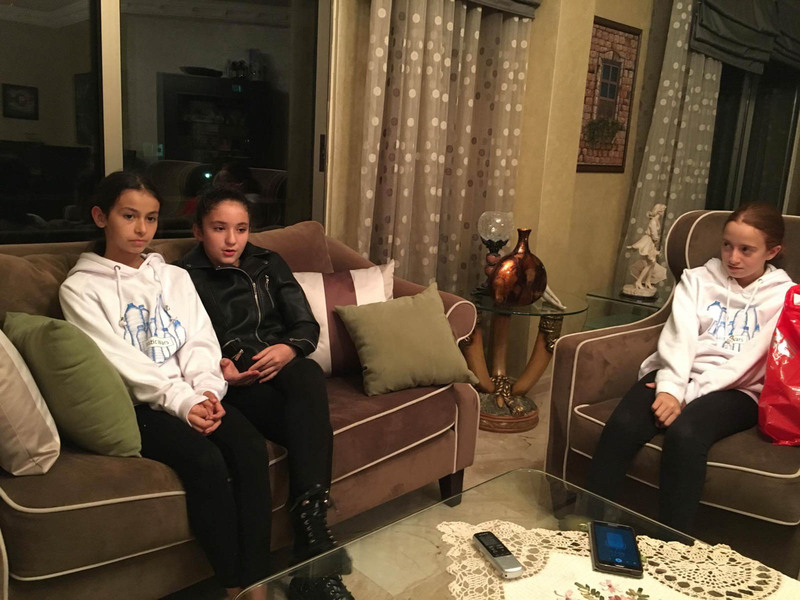 Farah Qub’a, Jana Zabaneh, Zaina Amro, and Tina Khreis are just four girls trying to make a difference for their country, creating their own initiative to encourage people to reduce plastic waste. “We build a Facebook page and a Youtube channel,” Farah explained. 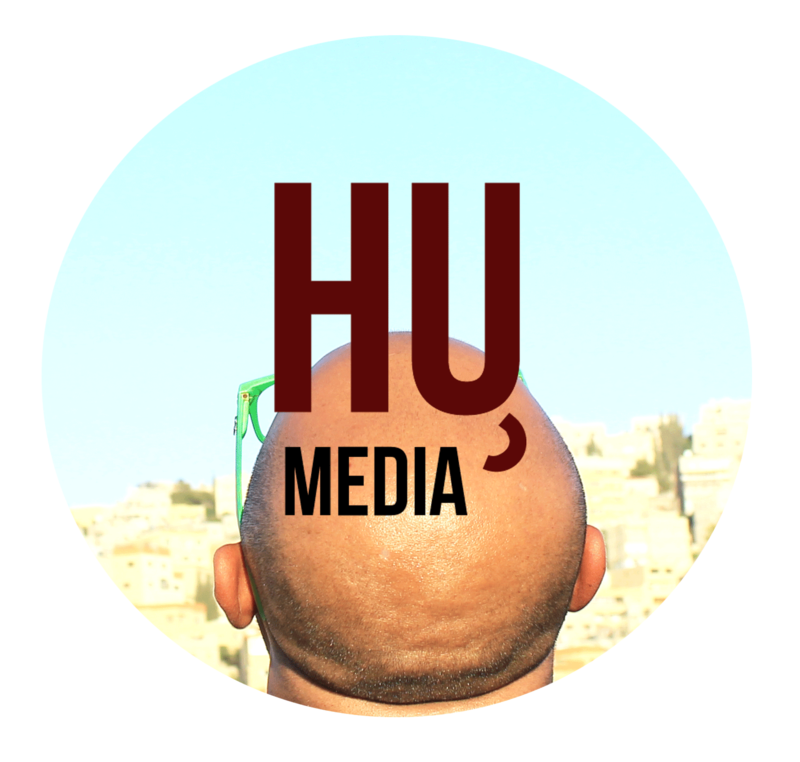 “In the Facebook page we talk to a bigger audience — talking both in English and Arabic — and we talk about our plans and how plastic is bad. The four students created an initiative called Plastic Wars which encourage the people in Jordan to recycle and reduce waste. “Our objective is to try and tell people about the dangers of plastic on animals, plants, and humans and to visit experts that can help us and support our ideas,” Jana said. Plastic continues to be a problem in Jordan and worldwide, reaching 322 million metric tons in 2015, according to Statista. While according to a research by the Royal Scientific Society, Jordan’s plastic waste is the second largest contributor of waste at 15.7 percent — next to organic waste at 49.7 percent. 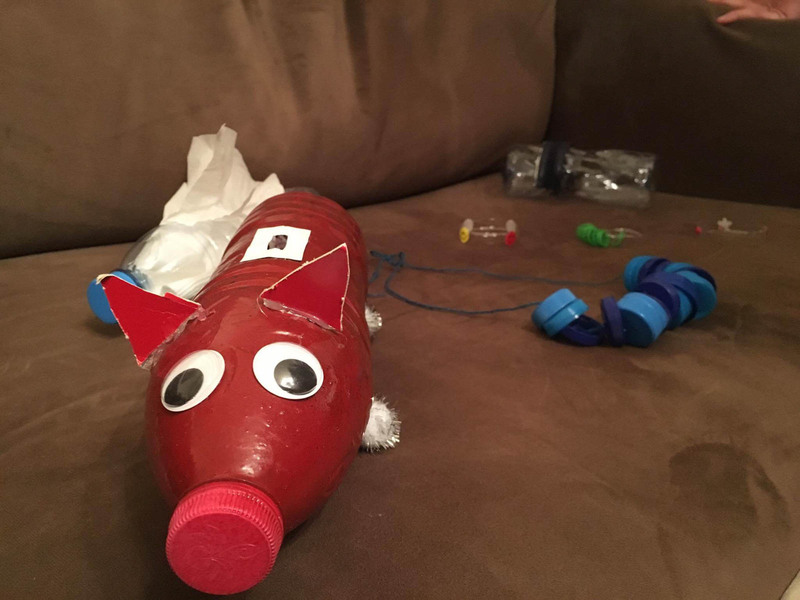 “As you can see plastic has many disadvantages that’s why we made the project,” Tina said. 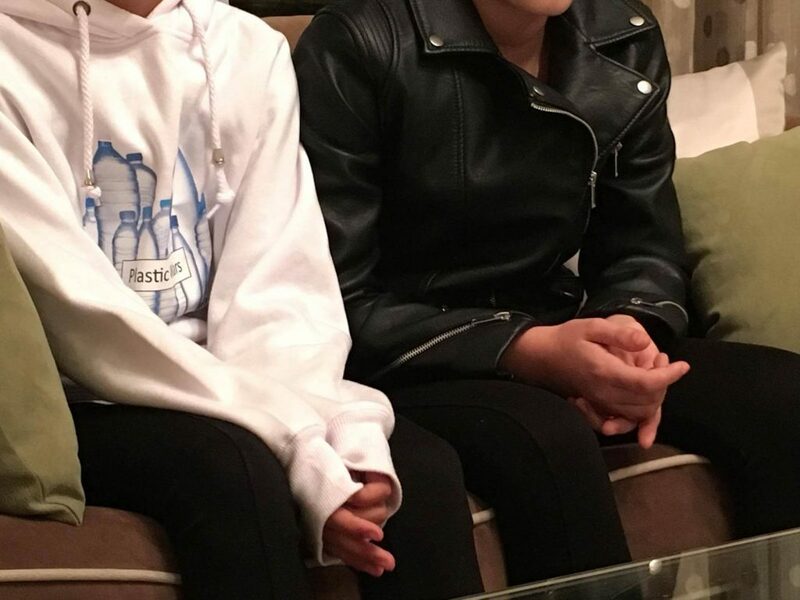 The girls explained how they wanted to create a better future for their country and would like to achieve that by raising awareness about the importance of recycling. “We’re aiming for an eco-friendly country that doesn’t have plastic and doesn’t have any waste on the streets,” Zaina explained. 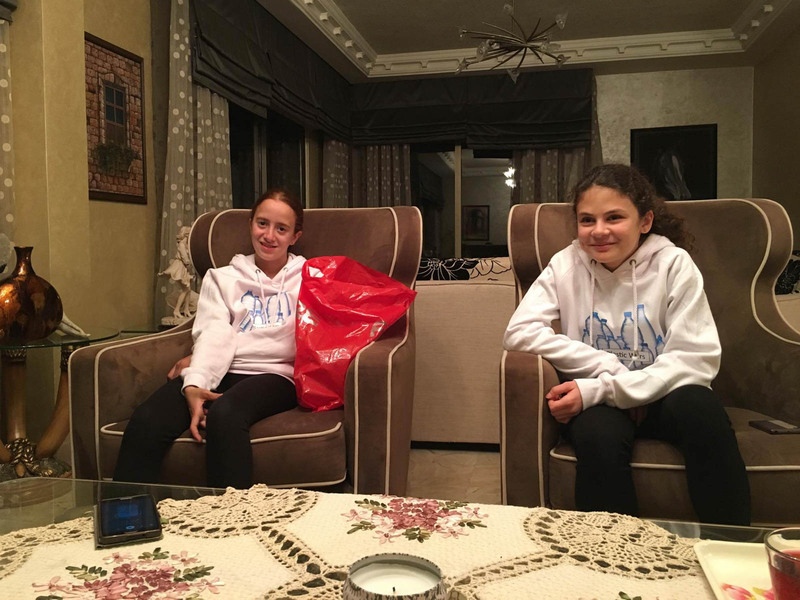 “We also decided to go to the poor and orphans to give them some plastic bottles and the first one who does something creative with it will get a prize,” Tina said. “Some people supported us with money, so with the money, we’re going to do brochures and flyers and put them in the supermarkets, so when people buy stuff they can just look at it,” Zaina said. “These brochures have tips on alternative plastic so people can know the advantages and disadvantages the way they can reduce plastic,” Jana added. The team said they didn’t want people to stop using plastic completely — as it was a vital part of Jordan’s industry, however, they wanted people to be smarter in using them. “We don’t want to shut down the companies of plastic because it’s really big part in Jordan, so we want them to use the good type of plastic, the good numbers we can find under our bottles or products that we use,” Farah said. Jana also noted it was not only about getting people to reduce litter but also to recycle. 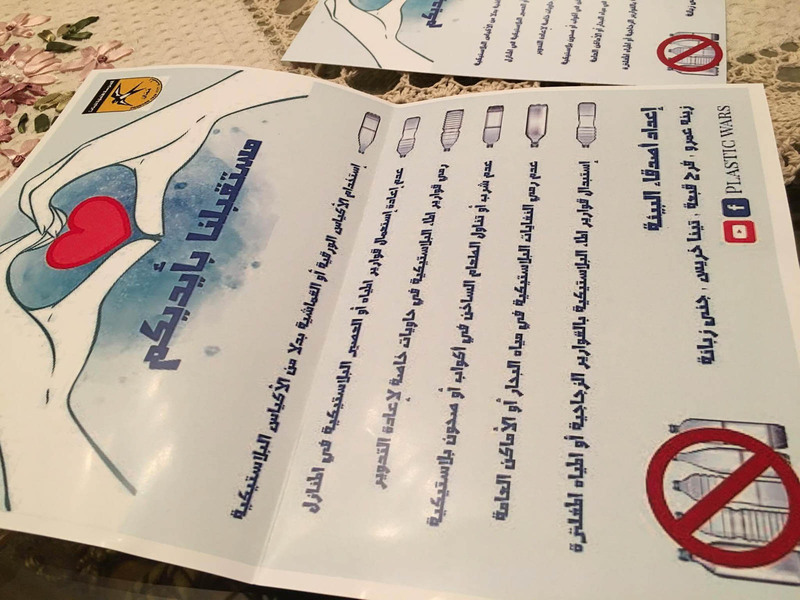 “We’re not only aiming at people who throw plastic out of cars, we also want Jordanians to separate waste like plastic, glass, and more,” she said. “For example, in England and France, the garbage man won’t take the trash unless it was separated because it will be easy for recycling. The why and the how? Farah, Jana, Zaina, and Tina said the project all started from a competition by the Goethe institute which eventually led to a bigger initiative. “We started from an institute called Goethe but we want to continue, we don’t want to stop,” Jana explained. “Each month we will take a problem that’s happening in our society and change it and the competition was about plastic because people from outside the country came and saw plastic on the streets of Jordan and how we’re not reusing and recycling plastic. “It wasn’t a really big part of our lives but after research and we knew more about it, it started to become a serious thing,” Farah said. 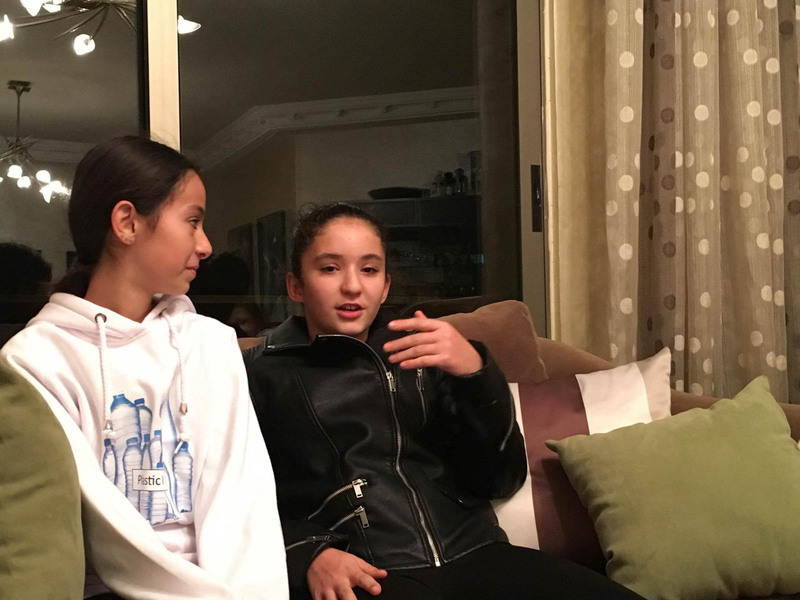 “When we went to the municipality, we talked to the Mayor of Amman and he told us when Americans come here they tell us we have a lot of black bird but turns out they’re black plastic bags flying around,” Tina added. The young environmentalists said they started working together with their schools and progressed from there. “We started with our schools, but then we went around the neighborhood and gathered more,” Farah said. “Also, we’re collecting plastic from our homes because we use plastic so much and we don’t want to throw it, we want to collect it so we can recycle them,” Jana added. 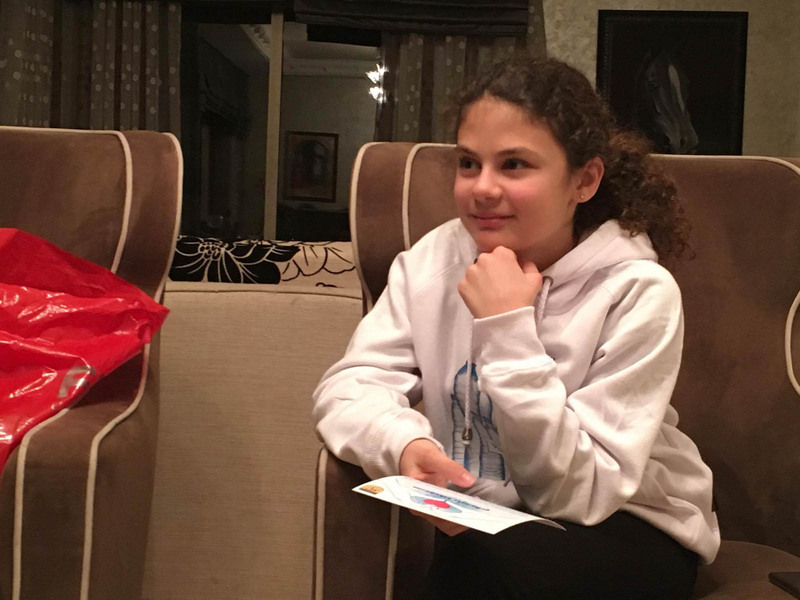 “We asked different stuff from people that make decisions, like that time we went to the Amman municipality and we talked to the mayor about how we wanted to create change and how we want recycling bins and stuff and they told us it was hard to change the culture because if we put it around it wouldn’t help,” Farah said. “They told us in the future they’ll put all kinds of recycling bins in Amman but the problem is no one listens,” Zaina said. The girls have been trying to create awareness from social media for their project — hoping to target more of the younger generation. “We’re raising awareness by Facebook posts and Youtube videos,” Jana said. The girls said though they were trying to make a change having people listen to them was not the easiest thing. “When you’re in the car, personally, I used to throw stuff out of the car but now that I know it’s bad, I don’t do it now,” Farah said. “We want to make people listen to us and stop throwing plastic,” Zaina said. They were hoping they would gain enough supporters from their social media page to create a movement, as well as other efforts. “On our Facebook page, we tell them why would they want to do this, why do they want to stop throwing plastic,” Farah said. “We want our Facebook page to get more likes and viewers because a lot of people use social networks,” Tina said. “For our Youtube channel, we usually show cartoon videos or tips on how to create DIYs,” Jana said. “We also think the brochures will help,” Zaina added. The girls hoped their efforts would bring a brighter future for their country and would somehow create a greater impact. “The kids I think will listen to us and they’ll start raising awareness with their families and it’ll be a start to do things differently,” Jana said. “We don’t want to be walking into garbage and create health issues,” Farah added. 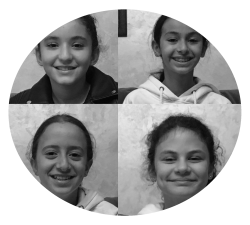 Farah Qub’a, Jana Zabaneh, Zaina Amro, and Tina Khreis are four friends that created an initiative called Plastic Wars, aiming to encourage people in Jordan to recycle and reduce plastic waste. The girls want to create a brighter future for Jordan as an eco-friendly country. The young environmentalists currently are encouraging people through Facebook and their YouTube channel. 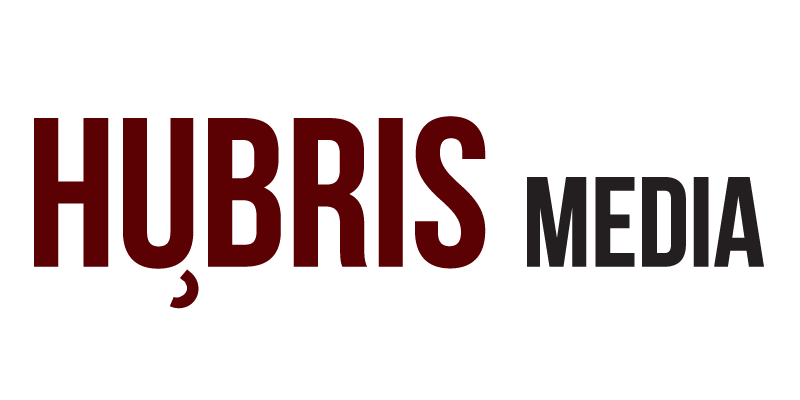 Please show your support by checking out their Facebook and YouTube.